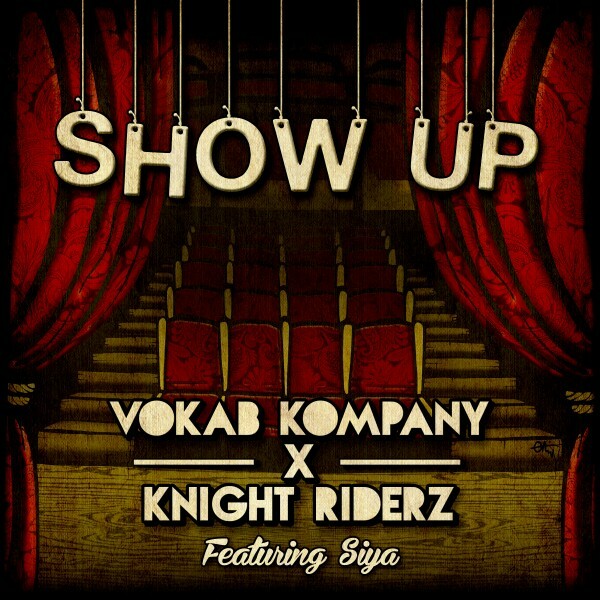 California-based Hip-Hop/EDM hybrid Vokab Kompany have teamed up with Canadian “Future Booty Bass” producer Knight Riderz and Brooklyn MC Siya to release their latest single, “Show Up,” via Do Androids Dance. This marks the second time Vokab Kompany and Knight Riderz have worked together, the first collaboration being “Just Above the Clouds.” Knight Riderz has described his production as “Future Booty Bass” and infuses elements from EDM sub-genres such as Trap and Moombahton. His production style serves as the perfect backdrop to showcase Vokab Kompany’s genre-hopping capabilities seamlessly. The party-friendly single opens with Siya rhyming confidently over the track that’s juxtaposed with ambient production full of stuttering vocal echoes, synth sounds, and reverb; slowly building into a low BPM frenzy full of hi-hats, bass and horns. Following Siya’s verse, the focus shifts to Vokab Kompany’s Rob Hurt and Burkey. Showcasing their rhyming prowess, the group raps ferociously over the beat, switching up their flows into double time and back before refraining to the track’s title. “Show Up” follows their 2013 release, V-Sides, a collection of remixes and collaborations. Previous releases include 2011’s Quit Sleep and 2012’s VKCE. Please contact Michelle or Rory if interested in talking with Vokab Kompany. Vokab Kompany are two MC/singers from San Diego, backed by their 4 piece band of awesome. Their live show combines multiple synths/keys with bass/drums and a violin to create a sound that doesn’t quite adhere to a specific genre, but seems to fit the bill with several. Their new album, VKCE, a collaboration effort with up and coming production/ musician duo Crush Effect (featuring members of Funk/Jamband legend Karl Denson’s Tiny Universe) on VKCE filling a void at the intersection of the hip-hop and EDM worlds. VKCE is Hip-hop, it’s electronic, it’s indie – it’s a shout out to the past, and a taste of the future. Vokab Kompany’s Matt Burke describes the experience: “As musicians, it’s an ever evolving world; genres are a thing of the past, so we (VK) were really lucky to have teamed up with producers that pushed the boundaries of our boxes. We got outside our comfort zone, stamped a VK next to CE, and the result was something new entirely.” The brazenly dynamic sound on VKCE has quickly garnered the attention of television and film. The record already has two national commercials, for a major carmaker (debuting 2013) and Southern Comfort. The album debuted at #47 on the iTunes hip-hop charts, behind only major-label releases from T.I. and Chief Keef among all hip-hop records released that week. The team has been blessed with a slew of great press. In addition to a feature on electronic music in the August print edition of SPIN, and “climbing” George Washington Bridge with Al Roker, the band has won best hip-hop group at the San Diego Music Awards for three years in a row, and even impressed Prince Charles when he stopped by Solana Beach’s Belly Up to catch a VK show.